Fresh off its inaugural weekend, the new Veterans Plaza in downtown Silver Spring appears to be a success, mobbed with people despite the ongoing heat wave. But residents who protested a deal giving much of the adjacent Civic Building had been to Round House Theatre might be equally surprised to find their new town square's become a de facto skatepark. Designed by Boston-based architecture firm Machado and Silvetti Associates, the building and adjoining plaza put a fresh, modern face on two very traditional functions - a community hall and town square. 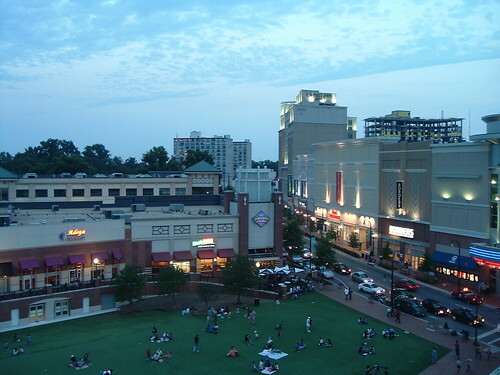 On a visit Saturday evening, it's clear that Silver Spring residents have taken to the space as they had to "the Turf" before it was ripped up in 2008 to make room for the plaza. Left: Veterans Plaza today. Right: "The Turf" in 2006. Up on an elevated walkway between Fenton Street and the Whole Foods parking lot, a row of shoppers-turned-spectators admire the whole scene. Their eyes are fixed on the Civic Building, where a dozen teenage boys are making the skatepark Silver Spring has yet to give them. They line up in the wide portico holding their skateboards, taking turns as they did jumps off a couple of steps a hundred feet away. "Looks like they've already turned it into a skatepark," I hear a middle-aged couple grumble as they walk past. Skaters line up to do tricks in the plaza and spectators gather to watch. A block away on Ellsworth Drive, it's business as usual: people are crowded around a stage for the weekly summer concert series, and a security guard is lecturing a kid on rollerblades. Except ten minutes later, I see him in Veterans Plaza, making a slalom course out of a line of benches. 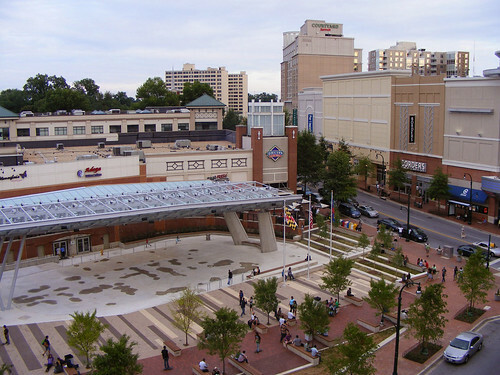 The Downtown Silver Spring complex on Ellsworth Drive has always had a tortured relationship with skaters, who flock to the street despite being harassed by security guards. Are they directing skaters off their property and into the public plaza? 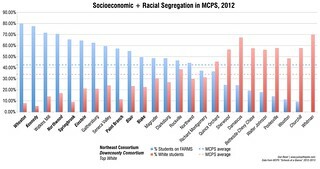 If so, would Montgomery County kick them out as well? 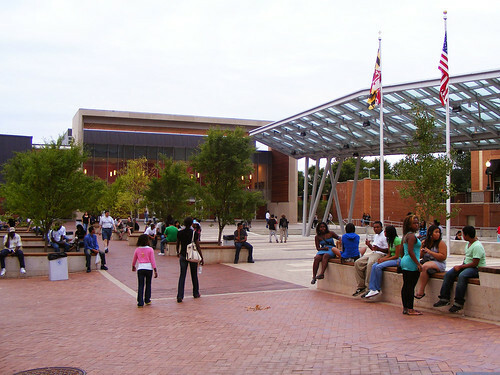 "Definitively an issue," writes Reemberto Rodriguez, director of the Silver Spring Regional Services Center, in an e-mail to JUTP. "It is a balancing act between how to be welcoming of all activity that brings the Plaza alive with the charge to keep it clean, safe, and in good condition." He notes that he's seen a "very positive reception" to skaters from other people in the plaza. Looking south through the plaza towards Ellsworth Drive. 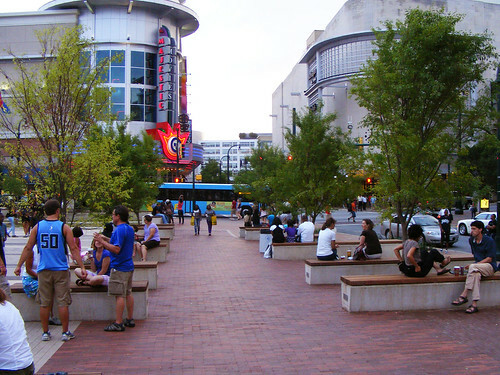 The need for a skatepark in downtown Silver Spring has been known for years. Kids are often kicked out of otherwise-unused pocket parks and on Ellsworth Drive and elsewhere, though planning for a temporary skate spot in Woodside Park is underway. It's not surprising that they've taken to Veterans Plaza with their skateboards. The question is how they'll get along with everyone else who'd like to use the space and how to handle potential conflicts between them. On his blog, Rodriguez has drafted a "code of conduct" for the plaza - what he calls a "statement of our desires, expectations, and commitment for public behavior." He's looking for suggestions from the community to make it better. For now, at least, the county wants to make everyone welcome in Veterans Plaza. "I am in conversation with the skaters - and many others - to see that we do this in a way that is respectful of all," writes Rodriguez. 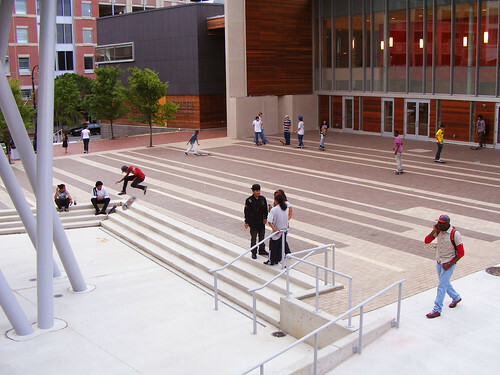 Well I guess when the first person is hurt by a skateboarder, or a skate boarder hurts himself on the property, and a lawsuit is filed against the city of Silver Spring the issue of skateboarding will change. Pretty soon the benches will become beds for the homeless, and at night the plaza will become a public urinal for the homeless. If you don't think this will happen- check out the space behind the McD near the Metro after dark- someone is sleeping on those benches. Check out the park across from the Bank of America. When your homeless and you gotta go- well you go where you can. You ran for County Executive, right? You know there isn't a City of Silver Spring. 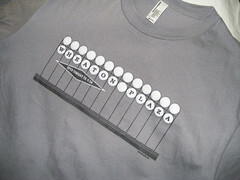 Anyway, there's a good chance that the plaza won't become a "public urinal." Those parks in Silver Spring that do attract the homeless are underused and often designed to repel anyone else from going there. Veterans Plaza is big, open, and in the middle of a busy, well-patrolled area - a big deterrent to anyone who'd try to urinate there. Ok Dan, Silver Spring a large, unincorporated urbanized area may be subjected to a law suit. As for the public urinal- I do not expect anyone will use it for that purpose during the day. Looking at your photo, that covered ice skate rink makes more sense. Those doors that head under Baja Fresh and Adajo are probably the ready area/green room (not sure of the term) and a stage could be set up in front of the doors (perpendicular to Fenton). I wonder if those concerts held in the Elsworth plaza will move to this area. It would make more sense than having people walk through that pass-through from the garage only to come up against the back of the stage. Regarding the Round House Theater having space in the new building. I hope it means that they'll do more here. Their Silver Spring operation seems like an afterthought as compared to their activity in Bethesda. I'm not sure about the skateboarders hurting anyone, but they certainly are going to have an impact on the area through a lot of wear and tear on the surfaces, particularly the edges of things. Hopefully the other users will hold their ground and not concede the area to the skateboarders. And I've been told that when concerts happen in the plaza, the portico in front of the Civic Building will be the stage, not the ice rink - which I agree isn't the best use of space. I do wonder how they intended to program the ice rink when it's not winter - it's a big, covered space and could carry a variety of uses. That's too bad about the stage orientation. That skating rink cover looks like a fairly reasonable band shell. Earlier this evening I was told by Mike Moore, the evening supervisor for the Urban District red shirt crew, that 'no skateboarding' signs will be going up soon. I took the opportunity to let Mike talk to the skater who recently had a knife pulled on him by one of those red shirt guys, because the skater didn't pick up some trash left by others. Prior to pulling a knife on the skater, that red shirt dude attempted to take another skater's skateboard. These kids simply don't matter in this community, and they get kicked out and treated like crap by anyone and everyone with a little bit of authority. And soon, we'll all be pushed into the tiniest skate spot possible (Woodside), where maybe 5-7 skaters can skate at one time. There's plenty of indication that it was never intended for us to be allowed to skate Veterans Plaza, and my guess is that they're only letting us skate there now because Woodside has not yet opened. One of those indications -- when I recently met with Reemberto Rodriguez outside the Regional Center's offices, the president of Silver Spring Town Center, John Lorrie (sp?) just happened to pass at that exact same time. He told me I better not let skaters skate at Veterans Plaza, and he proceeded to rant about how angry and destructive skateboarders are. When I told him I care much more about kids than property, he seemed quite outraged by that notion. I walked through the other night and was struck by how uninviting the ice rink area is to anyone BUT skaters -- I say stick a couple of small ramps or other fun obstacles in there and let 'em have at it, in exchange for not skating in the more thickly-populated bench areas. The problem with the skateboarders is that they destroy property (skating on benches, graffiti) while they skate. Also, the noise and physical danger they pose to passing pedestrians is more than it's worth.